This vest chain features 6 charms- a gamsbart, deer horns, tooth, deer foot and antler/foot charms. Charms vary in length from 1 inch to 2 3/4 inches in length Total chain length is 9 1/2 inches for the small size or 11 inches for the large size. Imported from Germany. Silver plated. Sold by the yard. Imported from Germany. This charivari features hearts and bows. 1 1/4 inch hearts secure this antiqued Charivari to your Tracht outfit. Bows with dangling hearts cross the top and mieder chain with a centered dangling heart cross the bottom. 7 1/2 inches in total length. Imported from Germany. This earring has a pewter style heart hanging from a stud. 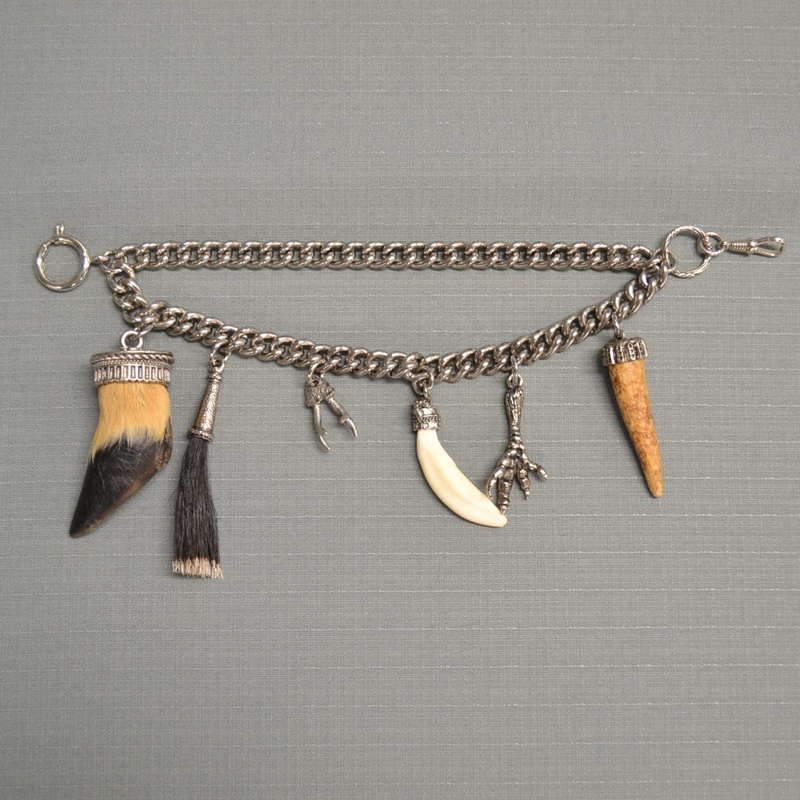 Chain with assorted charms featuring stag horn, coin, and other charms. Measures 14 inches in length. Made in Germany. Nickel plated Mieder Chain. Sold by the yard. Imported from Germany.